I read this post Blood Matters and it got me thinking. Could the reason why some parents, who early on understand why an adoptee would want to know their other family, simply be that, they have taken the time to think about the inherent privileges that they have, that come from growing up within their biological family? Is that how they understand that knowing both families takes nothing away from either, and in fact can enrich both? And could that be the same reason why some parents never get there, because they have never gone there, and instead assume that they are not good enough, or enough for the adoptee? And delving further, is that why they assume we are angry? Because they think, we feel our parents were not enough, and that is why we had to seek out our other family? For a’parents, I’d guess the thought process is prone to more convolutions, denial, and other forms of mental squirming than for those not directly involved in adoption. My a’mother got a lot of things wrong and continues to do so. She visibly stiffens when I use the A-word, and wants to change the subject immediately. But when I began searching, she didn’t miss a beat before saying “Good for you. I’d want to know if I were you.” She was capable of putting herself in my shoes that time, but not at many other times. I see the same continuum of awareness among adoptive parents that I do among men with regard to male privilege or among (my fellow) whitefolks with regard to that privilege. thanks for reading and linking to “blood matters.” as an adoptive parent, I would never say that adoption is beautiful. I think that T Laurel was speaking of John Q Public’s attitude in that statement – not parents. Really liked your post – it made me think. I did mean JQP’s attitude, not shannon2818’s. Sorry if it wasn’t clear. Shannon, I also liked your post–I hope it makes a lot of people think! T Laurel – thanks for talking. I was kind of leary about using the term biological priviledge but that’s what I realized from Shannon’s post and perhaps common understanding is as simple as talking about that. “Privilege” is a loaded term, and one I might not use in this context depending on whom I were talking to. For the purposes of this conversation, it “works” (for me). Long before motherhood, there was a time in my life that I was very interested in genealogy…and I was raised by my biological family. Still, at that time, it was very important to me to find out where I came from before the relatives I knew. If it was that important to me, knowing all that I already knew, how could it not be important to my children. We recently did DNA testing on all of us. We have found several cousins of Blueberry’s in the adoptee world in the US. Even at 5, that is important to her…to know cousins, especially the ones that we friends we’d already met. While we haven’t found relatives of Violet’s on there, we found out some information about her ethnicity that was completely unknown to us. It gave us information that we would have no other way of getting about family origins. This has thrilled her. Shannon and Veggiemom – did your classes have a discussion on “this” looking at your privilege vs simply talking about the different losses an adoptee may feel? The more I think about it the more it seems like it might really be that simple. Or is it simply different personality / levels of being able to step outside of yourself that matter, and if if that concept was offered it would make no difference? I never had a class that mentioned this, but I started thinking about it after I finished a book on adoption. It pointed out that many adoptees may go their whole lives and never meet another person who was biologically related to them. It made me think about how strange that would feel and all of the things that I take for granted as someone who has a large extended family. Shannon – did it make you change your view on adoptees searching in regards to you personally as the mom. Stumbling for words here but did it make you realize it had nothing to do with your relationship? Does that make sense – I am still coffee deprived. It actually didn’t change my opinion about that, we’ve always been open with our kids’ first family. They still have visits with several members of the family. And, I’ve always supported our kids searching for their parents whenever they’re ready (and their parents shouldn’t be too hard to find). I’m really not sensitive about my position as a parent (well in regards to their first mom anyway.) I really think there’s more than enough love to around. I guess it just helped me see that my opinion about blood relations isn’t the only one. 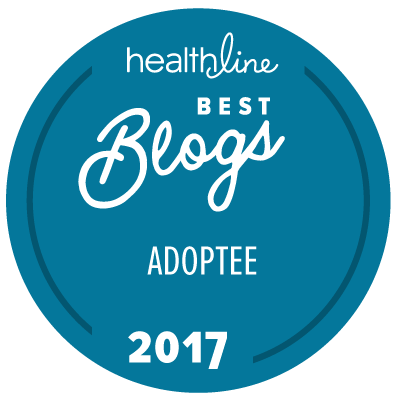 Actually, I think blogs by adult adoptees and first parents have made a huge different in my opinion about this (and many other opinions as well).